So, I had seen the tablet and immediately thought I should give it a try. Since being able to test it out I've been really taken back by how much I actually am using it. I have a laptop for work and I really don't like it... then again I don't really use it as a laptop because I have the docking station all set up. I haven't liked laptops in a while. Never really understood them. 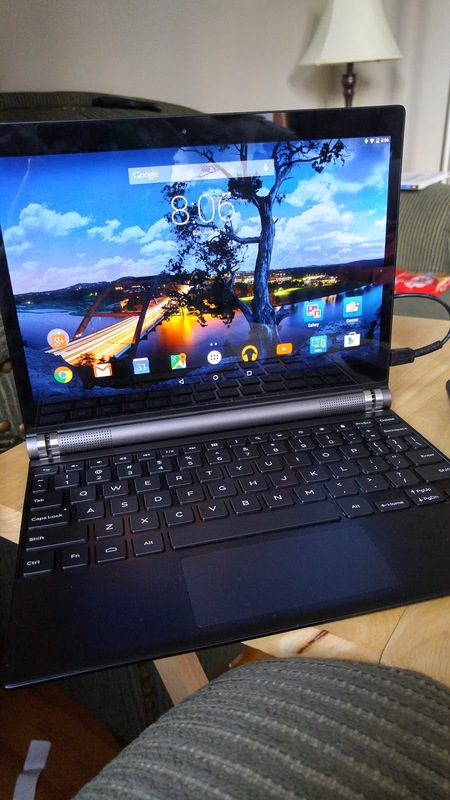 I did buy several of those Asus eeePC devices way back, but that was at a point where I was using a Palm Pilot and knew I wanted something more 'mobile' to compute on... they never really hit the sweet spot for me and for the most part just sat unused. They were cheap anyways. When tablets were first really announced, I knew I wanted one. I went out and bought the Transformer TF101. I waffled on buying the keyboard at the same time. I regretted it ever since, and how much I probably would have liked tablets a lot more. Since, there have been many tablets, and many keyboards, but not many that 'click' like it's supposed to. With this Venue, it's what you expect, it makes the full experience so natural that it's really hard to imagine using a tablet in any other way. Okay, let's talk about my 2 weeks with the Venue 7000 10" model. First up it's a tablet. You can't forget that ... it's meant to be used as a tablet - to that end it's a great screen and runs a very near stock Lollipop experience. I really won't focus on the Dell software experience as I've run over some of the features in previous articles. Suffice it to say that it has all the same apps and even the stereoscopic cameras on the back for you to do all those cool measurement features. 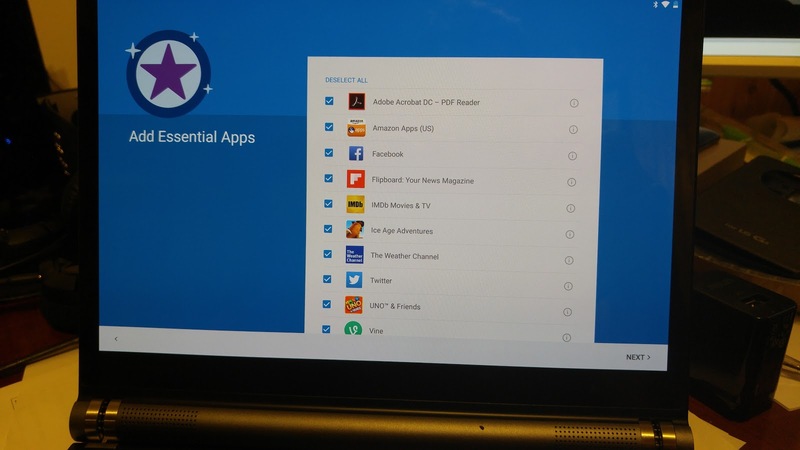 One thing I must have missed in previous tablets by Dell, but in the initial set up you're allowed to pick which of the 3rd party apps/bloat get installed. EVERY OEM should be doing this! Personally, I'd never use them, but they're neat. Okay, back to using it as a tablet. 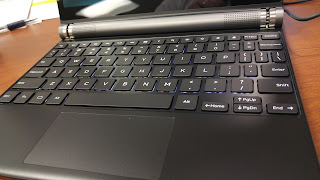 It has that 'roll bar' (that's what I call it) that's similar to those Lenovo Yoga tablets for you to grip on. And I found myself actually using it a fair bit that way as I wanted to read something. But I find that if I wanted to read something, most likely I'm going to use my phone as then I can just palm it. Gripping and holding something that big can be tiring for a length of time. That's where the keyboard comes in. It would be hard to imagine using the tablet and not getting the keyboard too. At a basic level it makes an amazing tablet stand for watching and holding your tablet up. It can do so in a 'tent' fashion... which is cool. But keep in mind that when you start to play some games it doesn't rotate 'upside down'; which is the fault of the developer of said game and not the tablet itself because most of the apps do work just fine upside down. You just have to notice that the L/R separation is now opposite for the speakers (not that you'd notice much anyways) and the volume keys stay the same (so pushing up means volume goes down). Now on to the laptop mode. And really, this is why you're going to want this. The way the device hinges together is quite cool - suffice it to say magnets are involved. Connecting them together gets the bluetooth to automatically connect the keyboard via Bluetooth so it's just seamless. Well, maybe there is a second or so delay before it's quite ready. Using it I have had some issues where it would say the keyboard was disconnected (actually, no real notice, it would just stop showing the cursor and then you'd notice the B wasn't showing as connected). A little weird as it seems to be happening on only some apps. Hasn't happened a lot, just enough to make me really curious. And that's the best part about this keyboard. When I got it, there was a lot of chatter from those around me saying "What? $150 for a keyboard?" Cass and Martin have been showing off their BT keyboards for way less. But neither of them have a built in trackpad. That is what I've been missing from my tablet experience. 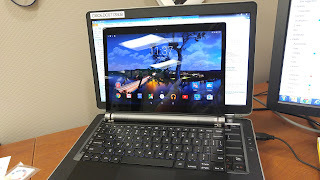 Using a keyboard on a tablet isn't new... but it becomes tiresome to type away and then having to move your hands from the keyboard up to the screen to interact. Doing it all from the keyboard is just natural (I'm good with touchpads... many I know aren't). What's cool is that the pad allows you to interact by tapping it for a click, or if you actually press the trackpad it'll click (but only nearer to the bottom of the pad). Personally I prefer to just tap. Battery life. From about 8am to 7pm and still had 33% and that was with some heavy usage games. So that's meaning a battery life of about 16 hours. 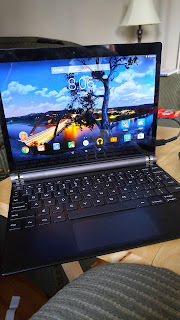 Overall this has been a great tablet... superb performance (and only 2GB RAM? ), stellar battery. Just the issue of the bluetooth on some apps, it's a little harder to open (I guess I'm just so used to using a laptop where I flip open the top, and not pull down the keyboard) and there's some keys I would prefer they rearranged (I'd want to see a multi button - doing the alt-tab thing kinda isn't super easy with Android; the menu button isn't quite in a easy to get space). There are some issues with using a mouse on Android that is a little weird - like swiping down for notifications isn't a simple click and drag, it's more of a click, then click and drag. Swiping away notifications you have to do sort of the same thing. Those aside, it's just that it's new and not how we do things normally on our regular laptops. But mark my word; with something like this, we're bound to see more of it as it is so nice to use. $750 is a bit steep; but it's definitely worth it.